BRRRRRR!!! It has been quite frigid here in Ohio...last week we had one day where our high temperature didn't even hit ZERO! Ah, but that is part of winter. This week at Eureka Stamps we are remembering those things that hang in our closets that take up lots of room...you know you have a few of them...things you bundle up in when it's cold outside! Oh wait - are you from one of those tropical places where bundling up means wearing a shirt over your tank top? I'll forgive you. LOL!! Come on over to Eureka Stamps and show us how you bundle up! Thanks for stopping by and spending a few precious moments of your day with me. God bless you!! And don't forget - Stay WARM!! The purple colors are just great! The snowball looks fun all sparkly! Super cute! Love the color combo and the snowball looks real! I LOVE your take on this cute bear, Zella. LOL How fun that some of used this stamp!!! Adorable card! Hope it warms up a bit soon out there. I have a brother who lives in OH (Oxford) so he always tells me when the cold weather will be blowing my way! Love this polar bear and how you colored him. The fun paper really goes great with the stripes in the scarf etc. Wonderful card, loving the colors. Such a cute card! I am on a purple kick and I have almost used up all my purple cs, LOL. Hi Zella, this is such a cute card. I love the colors. I wanted to introduce myself. I am your new teamie at Deedee's. Looking forward to getting to know you better. I am a new follower to your blog. Love how the stripey background matches the stripes in the image, and boy does that snowball ever glisten! Fab card, pretty design and gorgeous colours - I love the buttons. Thank you for sharing your work with all of us at Crafty Boots Challenges. A fun card, love the image, Thank you for joining us at GGM this time. Oh, I LOVE all that purple!!!! So pretty and that little guy is just precious. Lovin' those wonderful buttons too! Fun and cute, cute card! 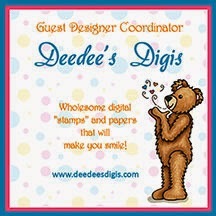 I'm looking forward to getting to know you better at Deedee's Digis! It's going to be fun. What a sweet card Zella. Love the cute image and the lilac hues. The buttons look great! Thanks for joining our Winter Wonderland Theme Challenge at The Bug Blog with Bugaboo Stamps! We hope you'll join us for the Bugaboo 4th Birthday Celebration that begins today! Love the purples on your card and the polar bear is perfect for a winter card. I hope it's getting warmer over there for in Ohio! Thanks so much for joining in with my challenge at CCM&M. Aww this is so sweet :) I love the colours that you have used and your fab buttons. Thanks so much for joining us at Crafty Cardmakers and More for our "Bear With Me" challenge.